Day 67 -- Sharing is Caring! Day 67 — Sharing is Caring! Jury duty ended for me yesterday. I never got called into the box to affirm that I could leave common sense behind and judge the facts just on what the court told us was the law! I could have done it, of course, but I am glad that I don’t have two more weeks during the holiday of showing up to court and then doing work when I got home! For Aurora, the end of jury duty means more play time… and more photos. I can be a bit pickier on what I publish, I guess. Today’s play was centered on the small tennis ball. It’s a favorite of Apex who played with Aurora and it in the morning. During the night play session we were surprised that Zenith decided to play ball. Really play ball! Apex has always been our play machine. Zenith, on the other hand, has pretty much adopted the activity level of our first litter’s princess, Audit. Zenith occasionally will do a couple puppy laps, but we could not remember the last time — before the advent of Aurora — that Zenith put a ball into her mouth. Tonight, though, the battle was fierce! Zenith and Aurora marched each other around the kitchen floor with mutual death grips on the lime-green fuzz. Day 67 — Mother and Daughter “Share” a Ball. Worth seeing close up — click to do it! Like all good family play sessions, there was no winner and loser. But, a lot of happy growling and running. 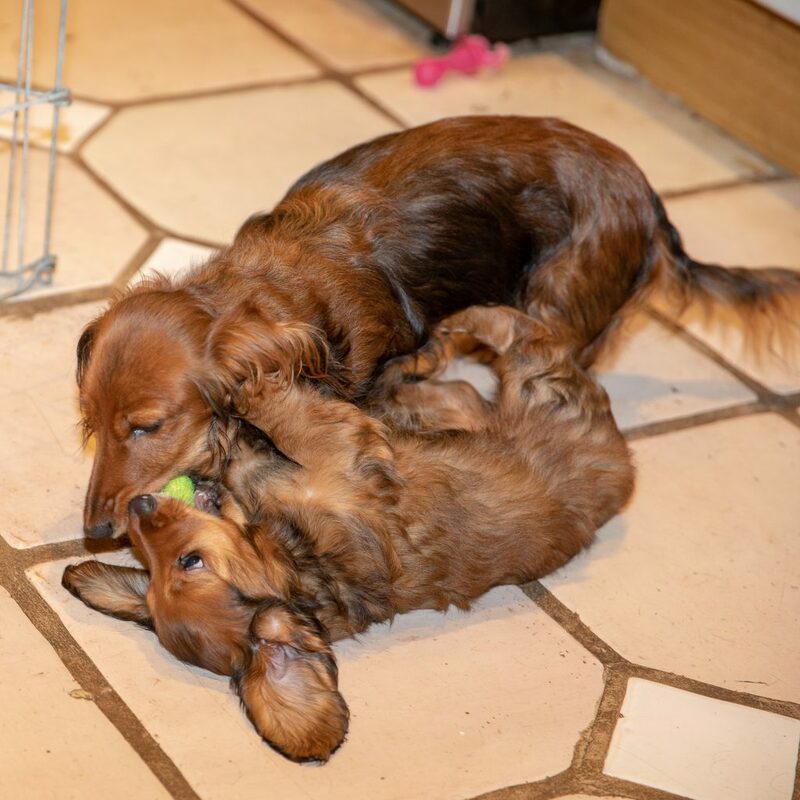 This entry was posted in dachshunds and tagged Aurora, dachshund, puppies2018, zenith puppies. Bookmark the permalink.